See Sarah Swatch: Last Guest Post from Cordia!! Last Guest Post from Cordia!! Hello, dear readers! I'm just thrilled to be guest posting for Sarah today! I've recently found myself to be strongly attracted to purple base polishes with lots of purple and blue glitter in them. I can't seem to stop myself from buying them! Here's a comparison of four relatively easy to find polishes that show case how pretty this combo is! From left to right, we have Sinful Colors Frenzy, Finger Paints Movie in the Park, Jessica Life of the Party, and Jordana Glitters LA City Nights. These are obviously not dupes, but they have definite similarities. Here is one coat of each glitter on a swatch stick. All of the polishes except Life of the Party actually have a clear base. Life has a sheer purple base and is also different with its holographic glitter. LA City Nights has the biggest glitter and the brightest colors. I think that's why I'm drawn to it most. I also like the lighter blue color of the glitter in Frenzy. Finally, Movie in the Park is pretty interesting with its all micro glitter. It evenl looks like it might be matte glitter, but it's so small, it's hard to tell. Here is two coats of each glitter. All of the polishes build up really nicely after two coats. I think I can definitely say that Movie in the Park is a matte glitter, which is just awesome. In fact, they're all awesome. I love the coverage each gives with two coats. I think they might even be wearable without underwear, which is always fun for glitters. I can't wait to play with these more. Are you on board the Purple Glitter Bus with me?? I love purple and I love glitter! These are amazing! Glimmer by Erica Swatches and Reviews! 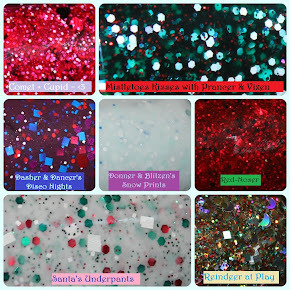 Guest Post from Marisa of Polish Obsession!